A Pinwheel as depicted in KC Deluxe. 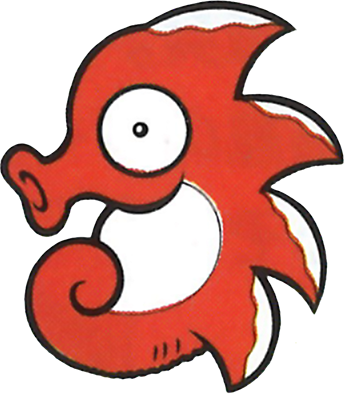 Pinwheels are aquatic creatures from Wario Land: Super Mario Land 3. They resemble tiny red seahorses with spikes, and first appear in Course No. 7 of Mt. Teapot. They dwell in bodies of water, and will curl into a spiked ball if Wario approaches them. They also bear a resemblance to Yurarin and Yurarin Boo of Super Mario Land. ↑ Wario Land: Super Mario Land 3 English instruction booklet, page 19. This page was last edited on January 3, 2019, at 22:00.